Every Baby is an Angel for Us. We Hope They would Growth Happily and Healthy . Our Aims are Provide a 'Safe,Soft,Healthy,Anti-Slip,Easy Wear,Reasonable Price ' Infant Shoes for Your little Angel. MATERIAL - Breathable and Comfort Cotton Blend. SOFT - Lightweight Well Cushioned Soft Bottom Sole is Good for Infant's Feet Growth Naturally and Healthy. EASY WEAR -Elastic Band Makes Our Infant Shoes easy to Slip on and Stay on Your Baby's Feet. 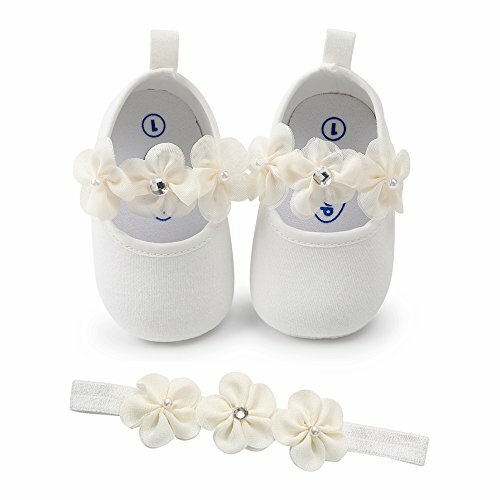 CUTE - Adorable Floral Design with Lovely Headband,Best Birthday Shower Baptism Gift for Newborns.